Lewisburg, Pennsylvania – Hackenberg Apiaries specializes in bee pollination, trucking, honey production and education in the beekeeping industry. David’s life’s work contributes to the overall pollination in six states: Florida, California, Georgia, Pennsylvania, Maine and New York. For information on education and speaking engagements, please email buffybee@dejazzd.com. See how we transport our valuable bee hives for bee pollination. Hackenberg Apiaries is a PA licensed trucking and shipping company. 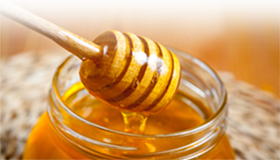 Carefully crafted and delicious honey bee products.